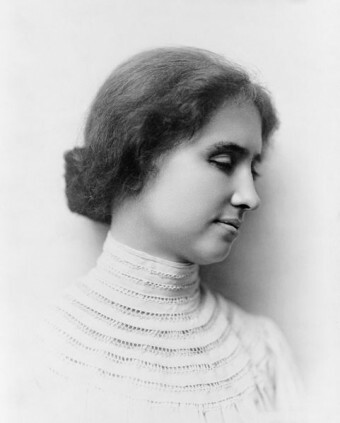 Myth: Helen Keller was born blind and deaf. In fact, Helen Keller was born able to see and hear just fine and continued to be able to do so until she was about one and a half years old. At that time, she became sick with some type of illness. What that particular illness was isn’t entirely known. However, it is thought that it might have been scarlet fever or meningitis, with the symptoms being described as “an acute congestion of the stomach and brain”. Whatever the case, after she recovered her health, unfortunately, she now couldn’t hear or see. Another common myth is that she had no way of communicating with her family until her teacher arrived around her seventh birthday. In fact, she had a very limited communication method involving about 60 home signs that she used, mostly in communicating with Martha Washington, who was the child of the Keller family’s cook and was Keller’s playmate. In 1886, when Keller was six years old, her mother read Charles Dickens’ American Notes, which were accounts of his travels through North America in 1842. The particular bit of those writings that intrigued her was a part about a deaf-blind woman that was successfully educated, something she had previously thought wouldn’t be possible. She then sought to find a teacher for her daughter. Her search eventually led her to famed inventor Alexander Graham Bell, who at the time was a teacher of deaf children (incidentally, his wife and mother were both deaf). Bell then recommended Helen’s parents to the Perkins Institute for the Blind, in South Boston. Once there, a 20 year old visually impaired woman by the name of Anne Sullivan was asked to become Keller’s instructor and eventually governess and constant companion. Their relationship lasted in this way for nearly 50 years. Despite being deaf and blind, Keller managed to learn to speak and could even read lips by touching people’s lips as they spoke. She could also similarly “read” sign language with her hands, as well as use it to communicate with other deaf people. Her ability to speak particularly aided her as she would frequently give various lectures and speeches as an adult. She also became an accomplished writer. Helen Keller’s father at one time was a captain in the Confederate army. Further, her grandmother on her father’s side was the second cousin of Robert E. Lee. On top of that, her grandfather on her mother’s side, Charles Adams, was a brigadier general in the Confederate Army. Keller also had an ancestor from Zurich, Switzerland that was the first teacher of deaf people in Zurich. At the age of 30, Keller’s eyes were removed and replaced with glass eye-balls. The motivation behind this was primarily cosmetic and was at the encouragement of her family as, while one of her eyes looked normal, the other bulged out significantly, marring an otherwise reasonably attractive face. For this reason, most pictures of Keller before the operation were taken from the side, hiding her bulging eye. The first thing Anne Sullivan taught Keller was the word “doll”. When she arrived in 1887 at the Keller’s home, she brought the gift of a doll for Helen. She then placed it in her one hand, while tracing the letters of the word doll in Keller’s other hand repeatedly. The learning process was exceptionally slow at first, because Keller didn’t really understand things like objects having names and the like. After around a month, though, when she realized the tracings on her hands were indicating the name of what was in her other hand, she immediately became like a sponge for information and didn’t like to take any breaks, but wanted to know the names of everything around her. Keller was good friends with Mark Twain, the two having originally met when she was 16. Twain played a key role in her life, introducing her to Henry Huttleston Rogers, an extremely successful self made business man, making his millions when the oil industry began to boom. At the encouragement of Twain, Huttleston saw to it that Keller had plenty of money for her education, which allowed her to earn a Bachelor of Arts from Radcliffe, becoming the first deaf-blind person to earn a degree. He also gave her a monthly stipend throughout most of her life. Interestingly, Huttleston Rogers was a descendant of Pilgrims who arrived on the Mayflower. Not only that, but his childhood sweetheart, who eventually became his wife, was also descended from Pilgrims who arrived on the Mayflower. Besides being a close friend of Mark Twain’s, Rogers was also extremely close friends with famed African American leader and teacher, Booker T. Washington. The two’s friendship was originally kindled after Rogers saw a speech given by Washington in 1894 in Madison Square Garden. After that point, Washington frequently guested with Rogers in Rogers’ 85 room mansion and on Rogers’ yacht. Through this friendship, Rogers was inspired to fund around 65 schools for African Americans, as well as providing much of the funding for the Tuskegee and Hampton Institutes. Mark Twain wasn’t Keller’s only famed correspondent. She also met every U.S. President between Grover Cleveland and Lyndon B. Johnson. She also became friends with Alexander Graham Bell and Charlie Chaplin. Further, she frequently corresponded with famed Austrian philosopher Wilhelm Jerusalem, who encouraged her writing talent. Keller wrote 12 books in her lifetime, along with a series of articles on various topics. Interestingly, the first story she ever wrote at the age of 11 was called “The Frost King” and was extremely similar to the story The Frost Fairies, by Margaret Canby, despite the fact that she had only been exposed to this story as a baby, which she didn’t consciously remember. Keller eventually suffered a series of strokes beginning in 1961, which stopped most all of her public appearances. She died on June 1, 1968 in her sleep. She was cremated with her ashes placed beside her two great friends and constant companions through life, her teacher Anne Sullivan, and her later friend and caretaker Polly Thompson. Four years before her death, President Lyndon B. Johnson awarded Keller with the Presidential Medal of Freedom. One year later, she was elected to the National Women’s Hall of Fame. Other famous deaf-blind people include: Sanzan Tani, who by the time he reached adulthood was fully deaf and blind, though he overcame this and continued to function as a teacher; Laura Bridgman, who was the first American child to be fully educated around 50 years before Keller; Robert Smithdas, who became the first deaf-blind person to receive a Master’s degree, specializing in vocational guidance and rehabilitation of the handicapped and for a time worked with Helen Keller; and Heinrich Landesmann, who was an Austrian poet and philosopher, who developed a form of tactile signing that now is named after him. Robert Smithdas is actually still alive today, only retiring in 2008 at the age of 83 years old. Interestingly, his wife Michelle is also deaf-blind. This leads one to wonder how exactly the two do things like locate one another in their home; presumably, something to do with using vibrations in the floor or the like. In any case, it would be fascinating to read about such things as this concerning the two. Like Keller, Laura Bridgman was also born fully able to use her vision and hearing. However, while only two years old, her family contracted scarlet fever, which resulted in the death of her two sisters and brother. It further left her not only blind and deaf, but also without the ability to taste or smell. She was soon very rudimentarily taught by a friend of the family, who enjoyed taking her out for walks and the like, though he himself was not able to teach her any language. Interestingly, despite the lack of language in her early years, she became quite skilled at knitting and sewing. Perkins School for the Blind is the oldest school for blind people in the United States, being founded in 1829. It was named after one of its founders, who was a very wealthy visually impaired shipping merchant. My son was born blind and Hellen Keller is an inspiration to my family. Thank you for this article. I have high hopes for my son that he’ll do great things. @Anonymous That’s the most retarded question I’ve ever seen here. my picture is a girl and im a guy what gives??? @No Name Needed: It automatically pulls in the picture based on email address I believe and what picture is registered with that email on gravatar. anyone know what helen keller did???? Lots. She read voraciously. Spoke in public. Wrote a number of books and articles. Entertained friends. Helen Keller is an amazing!! People who think that she is a retard are actual retards not Helen!!!! I think it’s important not to whitewash history and to recognize that Keller was also a rabid Socialist in the same vein as Eugene V. Debbs. I have a beautiful sister named Esther, who is normal. I am not. I am autistic. People who think I am a retard are stupid NOT ME! Helen Keller wasn’t born blind; she was a full term child who ended up sick. Hellen Keller quotes crack me up. They are all nonsense. Are you kidding me? Her quotes are so true! She was a very wise woman. Some websites say she is but some websites say she is not. She was mute for a short while but she figured how to speak by feeling peoples throats when they talked so she could feel the vibrations. After that she gradually started talking. It took about 20 years for her to be fully able to communicate through speech comprehensibly. I think it was amazing how she was able to accomplish all these things that people probably told her that she couldn’t (not that she could hear). But it was interesting to see what she did do to people and what people did for her. I don’t wish to be insulting, but I thought that everybody already knew this? I read a bio of Helen Keller when I was little.